After nearly ten years working in New York City’s bar and restaurant industry, John co-founded the Restaurant Workers’ Community Foundation as a means to address quality-of-life issues and increase organized activism in the restaurant worker population. 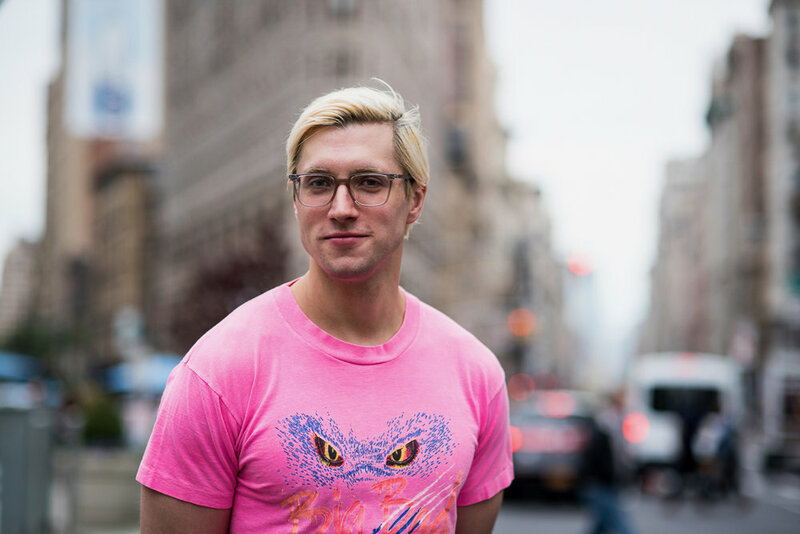 Starting out as a bartender at the acclaimed neo-speakeasy PDT (Please Don’t Tell) in 2008, John transitioned to working for the Momofuku restaurant group serving as their corporate Bar Director until 2018. As an author John contributes to publications such as Liquor.com, Bloomberg Pursuits, PUNCH, and was the deputy editor of Food and Wine Magazine’s annual cocktail book. He is also the author of a forthcoming cocktail book, to be published by Clarkson potter in 2020. Prior to entering hospitality, John worked for the Civilian Complaint Review Board of New York City, investigating allegations of police misconduct. John received his BA in East Asian History from Columbia College, and lives in the Lower East Side. Alex Pemoulie lives in her hometown of Seattle, Washington and is the Director of Finance for Sea Creatures Restaurant Group and co-owner of Mean Sandwich. Before returning to Seattle in 2015, Alex co-owned and operated Thirty Acres restaurant in Jersey City, NJ with her husband and worked as the Director of Finance for Momofuku in New York City. She and her husband have an opinionated and charismatic soon-to-be four year old. Alex received her BA from the University of Chicago and her MBA from New York University's Stern School of Business. Michael Hamill Remaley is currently the Lead Consultant and Board Treasurer to the new public charity Restaurant Workers’ Community Foundation. He is an independent consultant to nonprofit and philanthropic organizations with a client roster that includes the J.M. Kaplan Fund, the Support Center for Nonprofits and Inside Philanthropy. Previously, he was Senior Vice President for Public Policy & Communications for Philanthropy New York and also was the creator and Executive Editor of the New York PhilPost and PhilTV. In his role, Remaley built out the organization’s government relations practice and guided its issue-based working groups on education, health, justice reform, gender equity, Census 2020 and other issues. Prior to joining PNY, Michael had his own consulting practice, HAMILL REMALEY breakthrough communications. In addition to the firm’s work with nonprofit and foundation clients, he was the Co-Founder and Director of Public Policy Communicators NYC and was a regular contributor to The Communications Network blog, Philanthropy News Digest, Transparency Talk and other media focused on philanthropy and communications. Before 2009, Michael was the Communications Director for the Russell Sage Foundation and before that was Vice President and Director of Communications for Public Agenda. Earlier, Remaley held leadership positions with The Harwood Institute for Public Innovation, The Pew Charitable Trusts, TCC Group, Temple University’s Center for Social Policy and Community Development, and the Stockton Rush Bartol Foundation. Michael has a Master of Social Work degree from Temple University, with the primary focus of his graduate work on planning and evaluation. He has a B.A. (also from Temple University) in Journalism, concentrating in Public Relations. Michael is a member of the board of directors of the Stonewall Community Foundation. He is also a steering committee member of ComNetworkNY. Sam Penix is the co-owner and chief executive officer of Everyman Espresso. With three locations in New York City Everyman Espresso has been named the number one coffee shop in the U.S. In 2015 Sam was awarded Zagat’s 30 under 30 culinary game changers redefining the industry. He’s also been certified as a U.S. Barista Championship judge. His passion for community has created magical cafes across the city of new york that combine high quality beverages and physical spaces where neighbors form transformative connections. Tiffany Langston creates content for a variety of communications channels, supports and implements issue-based campaigns and manages production of impactful collateral. She has worked at the intersection of nonprofits and philanthropy for nearly a decade, including overseeing communication efforts for Nonprofit Finance Fund, WaterAid America and Philanthropy New York, respectively. She is a James Beard nominated writer, and in her spare time, she plays poker, figure skates and volunteers with the Human Rights Watch Film Festival, Rescuing Leftover Cuisine and Meals on Wheels. Over the past 17 years, Lynnette Marrero has cultivated a new generation of cocktail bartenders and elevated the level of craft of mixology at internationally renowned bars and restaurants and as a consultant for brands and top spirit’s and beverage companies with her company DrinksAt6. She is currently the Bar Director for Llama Inn, Brooklyn, NY. Lynnette is the President LUPEC NYC an organization to promote women bartenders while raising funds for women’s based charities. She co-created and produced Speed Rack, a global cocktail competition for women bartenders that raises money for breast cancer related charities.. Marrero has judged the renowned Global Cocktail Competitions, presented industry seminars at International cocktail festivals, was the 2016 Ambassador of the Chile Cocktail Week. She was an inaugural Honoree at the Dames hall of Fame at Tales of the cocktail, and in 2009 Marrero was honored by the James Beard Awards as one of America’s Leading Female Mixologists. Marrero was named Food and Wine with Fortune Magazine’s Most Innovative Women in Food and Drink 2015 and recently names Wine Enthusiasts Mixologist/Brand Ambassador of the year 2016. Jayanthi K. Daniel is the executive officer to the Chief of Staff in the Office of Los Angeles Mayor Eric Garcetti. She works directly with Chief of Staff Ana Guerrero, the first Latina chief of staff of a big-city Mayor. Jayanthi helps the Chief of Staff with decision-making and processing both for and on behalf of the Mayor. Before joining the Mayor's Office, Jayanthi received her masters in social welfare at the UCLA Luskin School of Public Affairs. She focused on non-profit management, policy development and evaluation, and advocacy for underrepresented populations, particularly older minority adults. During her time at UCLA, Jayanthi established an expertise in clinical “micro” skills in order to build relationships as a method of enacting more effective advocacy for populations in the “macro” systems of policy and governance. Prior to enrolling at UCLA Jayanthi worked as a journalist for 10 years in New York City. She began her career at the New York Sun newspaper, and subsequently worked for Saveur magazine, a monthly culinary periodical, and Africa.com, a start-up news website. In 2014, Jayanthi began volunteering at the Mount Sinai Hospital in Manhattan, working in the hospital’s geriatric emergency department. At Mount Sinai, Jayanthi decided to switch careers to social welfare, seeing that a population of older adults required an entirely different set of interactions from hospital staff. She came to understand that beyond the hospital setting, adults needed policies directly related to their experience in growing older in America. Brette Warshaw is the operations and finance consultant for RAMONA. She comes to the team from the publishing industry, where she most recently was the Chief Operating Officer of Lucky Peach. She started her career in editorial, where she was the Managing Editor of Food52 before launching the James Beard Award–winning luckypeach.com. She studied history and creative writing at the University of Pennsylvania, and wrote her thesis on Jell-O marketing in the Great Depression. In her spare time, she enjoys throwing dinner parties and organizing her pantry. Loren has spent nearly a decade of his life behind the stick before realizing hospitality needed more people to stop the man sticking it to them. His life and work missions are driven by helping create new systems and dismantle problematic ones. He helped reframe how the Oregon Bartender's Guild fundraised and created a charity and aid position that provided local service workers with financial help. His voice is often sought after for help in changing platforms, and he is working to make sure any access and opportunity he gets becomes extended beyond him. Nowadays, his work is primarily within LGBTQ-focused needs, he's a believer that you can't help one community if you cannot incorporate intersectionality along with it. Whether it's one person or a room of hundreds, his goal is to listen and teach so others can take action and gain understanding. Change isn't something you can make people do, but you bring them the tools so they can learn about why it's needed and make that change. With more than 20yrs in the hospitality industry, Sara Jimenez-Curtola hails from Dublin, Ireland, starting her restaurant career at family-owned restaurant Da Pino. Sara then moved to London and worked for a brief time at Richard Corrigan’s Bentley’s Oyster Bar & Grill, before joining Fergus Henderson’s team at St. John Bread & Wine. Once the time had come to leave London, New York was the obvious next city. In 2011, Sara moved to New York to work for Momofuku; starting as the General Manager of Momofuku Ssäm Bar. She was the opening General Manager of Momofuku Nishi, when it opened its doors in 2016, ending her tenure with the group at Ma Peche, this year. In her spare time, Sara is a full time mom. Professional bartender Sother Teague is the Beverage Director at New York bitters bar Amor y Amargo, co-founder of NYC bar Coup, partner of Blue Quarter and Windmill, and the co-host of “The Speakeasy” on Heritage Radio Network. He developed a love of teaching while working on the Food Network series Good Eats, and has been featured as a cocktail expert in countless outlets including Esquire, The New York Times, New York Magazine, Time Out, BuzzFeed and more. His first book "I'm Just Here For The Drinks" was released in 2018. Beeta is the director of strategy and communications of The Tow Foundation where she is responsible for amplifying the visibility of the Foundation’s work and actively engaging external audiences on solutions in the areas of justice reform, medicine, higher education and culture. She researches and implements strategies to accelerate impact through collaboration, targeted communication, strategic planning and engagement with external partners in key communities and with the public at large. Prior to joining the Foundation, she was the senior director of learning and programs at San Diego Grantmakers. Beeta is a board member of the steering committee of The Communications Network's New York group. Previously, she served as a screening committee member for the Human Rights Watch Film Festival, chair of the Junior Board for Girls Inc. of New York City and a co-leader of the NYU Wagner Alumni in Philanthropy group. Beeta earned her M.P.A. in Public Policy and Nonprofit Management and Administration from the Robert F. Wagner Graduate School of Public Service at New York University and her B.A. in Gender Studies from Bard College at Simons Rock, an early college. Zachary is currently working as an in-house consultant with Support Center for Nonprofit Management to launch their new Organizational Navigator Program. Over the past two years, Zach has transitioned his career from intellectual property litigation, at Pepper Hamilton LLP, in Boston, MA, to focusing on capacity building and program development within the nonprofit and government sectors. Zach returned to New York City in August 2017, after a transamerica bicycle trip to participate in the Coro Fellowship. Since returning to NYC, Zach has consulted for the Department of Design and Construction, building a Virtual Reality Program for the STEAM High School Summer Internship Program; worked with Restaurant Opportunities Center of New York, reestablishing the One Fair Wage Coalition and aiding research into after-hours childcare; and the Robert Sterling Clark Foundation to design an automated resource directory for Leadership Development programs available to New Yorkers. Amanda is the James Beard-nominated chef and owner of Dirt Candy, the award-winning vegetable restaurant on New York City's Lower East Side. She is also one of the Iron Chefs on Iron Chef Canada alongside Susur Lee, Lynn Crawford, Rob Feenie, and Hugh Acheson. Dirt Candy was the first vegetable-focused restaurant in the city and the leader of the vegetable-forward movement. The restaurant's original location only had 18 seats and was open for seven years, during which time it became the first vegetarian restaurant in 17 years to receive two stars from the New York Times, was recognized by the Michelin Guide five years in a row, and won awards from Gourmet Magazine, the Village Voice, and many others. Its new location opened in January, 2015 and it was the first restaurant in the city to eliminate tipping and share profits with its employees. Amanda was the first vegetarian chef to compete on Iron Chef America and her comic book cookbook, Dirt Candy: A Cookbook, is the first graphic novel cookbook to be published in North America. It's currently in its seventh printing. She is also a Canadian. In 2018, New York Magazine named Dirt Candy "The Absolute Best Restaurant on the Lower East Side" and Wine Enthusiast named it one of the 100 Best Wine Restaurants in America.